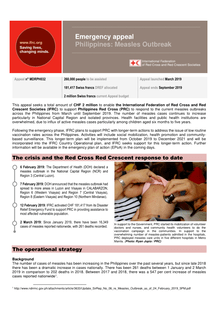 This appeal seeks a total amount of CHF 2 million to enable the International Federation of Red Cross and Red Crescent Societies (IFRC) to support Philippines Red Cross (PRC) to respond to the current measles outbreaks across the Philippines from March until September 2019. 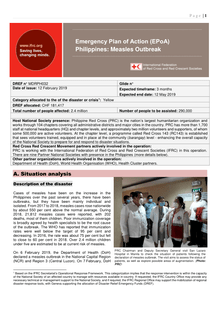 The number of measles cases continues to increase particularly in National Capital Region and isolated provinces. Health facilities and public health institutions are overwhelmed, due to influx of active measles cases particularly among children aged six months to five years.